User-configurable Charmin for your storage media. 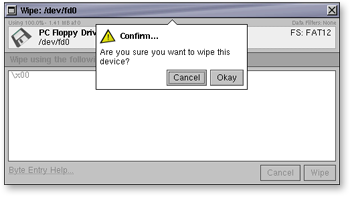 Wipe devices, partitions, arbitrary ranges… whatever. Every scientist should clean out their test tubes. You can enter any repeating sequence of bytes you want. Multi-pass secure wipe! Secure wipe is compliant with DoD and MilSpec specifications, Sir! The rest of the tools leverage and extend the functionality of SMART and are designed to safely export, virtualize and/or expose data in forensic images to “non-forensic” systems and processes. This enables functionality not available in other tools. For example, you can turn a cluster loose on a forensic image and have multiple nodes each performing I/O intensive processes concurrently (one node can hash while another indexes while yet another node searches, etc.). This approach enables cases to be worked much faster without “soaking the pipe” or swamping dedicated servers.